"Optimists make the best movers and shakers," commented one student on their submission to a club-level Optimist International Essay Contest. I agree! We are pretty lively, active in our community as we work to make a difference. It's great to see children recognize the personality trait - optimism - that helps one get things done. It with optimism that we remind you to get it done by February 28, 2017. Get what done? 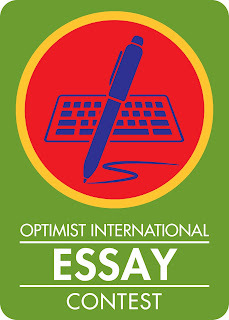 Submit your Optimist Club winning essay to your District Essay Chairperson. Valentine's Day, February 14, has come and gone for this year; however, that giddy feeling of love can stay with you every day. How can that be? Easy! 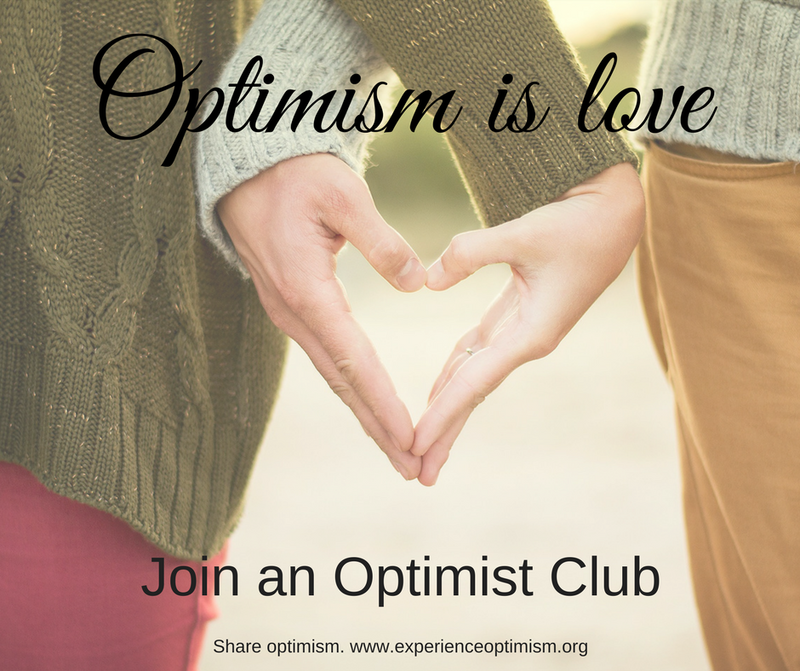 Join an Optimist Club and your attitude will change. Reading the Optimist Creed aloud with friends is just the beginning of a new, positive lifestyle. Among other things, soon you'll be performing random acts of kindness, planning projects and programs and giving your time to make your community a better place to live. That, my friends, is how you feel love. Now do it! Join your local Optimist Club today. 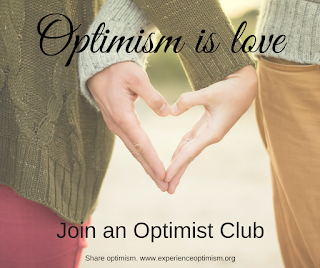 Click here to start a new Optimist Club in your community. It's an annual thing. Once per year in February, this website reminds all US Optimist Clubs to file their taxes. The form 990 is due February 15. Complete instructions and log-in filing information can be found here. Form990-N Electronic Filing System e-Postcard. It is free to file and required in order to maintain your tax-exempt status as an Optimist Club. How did you celebrate #OptimistDay? Yesterday, February 2, 2017, was #OptimistDay. Optimist Club members from around the world celebrated on Facebook and other social media sites. However, there did not seem to be much participation from Optimist Clubs in the Pacific Northwest. A couple of posts and a share or two was it. That's too bad. It was an easy project to conduct and it demonstrated unity with a larger group. Since the only way that one heard about #OptimistDay was through social media, only those who avidly follow social media knew about it. There wasn't enough lead time to write about it in club bulletins or talk about it at an Optimist Club meeting. Optimist Club members wear Optimist Club apparel all the time, when they participate in a project, attend a meeting, among other times. Wearing their apparel on one particular day seems routine. Not everyone likes to take a selfie. Not everyone likes to share their photos. The average age of an Optimist Club member is no where near the millennial category where photo sharing is the norm. So how do we fix this problem for #OptimistDay 2018? Keep the same date - February 2 - and start advertising it now in print as well as social media. It's a widely accepted statistic that one has to hear or read about something seven times or more before they take action. Use a hook for the apparel-based theme. Maybe everyone should wear purple or gold or something to help set off the Optimist International logo. Use the photos from those members who did participate this year to encourage other members to take pictures and share them next year. The photo didn't really have to be taken on February 2. The impact was in the share. I also believe that Optimist International should set a goal and purpose. Perhaps aim for 1,000 photos or shares as a way to show the fellowship of an Optimist Club. That idea might benefit from some refinement, but it's a start. Now let's do it! Show your Optimist pride on #OptimistDay 2018 and throughout the year. As February opens, Optimist Clubs begin preparing for the longest running and perhaps the most well-known international program: the Optimist International Oratorical World Championships. Previously known as the Optimist Oratorical Contest, in 2016, the program was revamped and with the help of St. Louis University, it now attracts participants from around the world to compete for a additional $5,000 and $15,000 scholarships over and above their $2,500 award at the District level. The topic for 2016-2017 is "What the World Gains from Optimism." Students under the age of 18 as of October 1, 2016 are eligible to enter through their local Optimist Club. For an application with contest rules, please click here: Optimist International Oratorical World Championships entry form. At the District level, students have the opportunity to win scholarships in the amount of $2,500 - first place, $1,500 - second place and $1,000 - third place. In the Pacific Northwest District, Ray Hilts is chairing the event and will help students locate a club near them that is hosting an event if necessary. Ray and Optimist International suggest that club-level contests be held by the end of March. A club planning guide may be found here. Lieutenant Governors will be coordinating Super Zone contests in British Columbia, Idaho, Oregon, and Washington. They have been asked to complete those contests by April 22, 2017 in preparation for the District finals to be held in Burnaby, BC during the PNW District 3rd Quarter meeting, May 6, 2017. Dates and details will be provided when known. If you need help, advice or encouragement in preparation for the event, please contact Chairman Ray Hilts at 541.928.0951 or by email.